I was interested this week to read on The Electronic Intifada two articles about the recent Palestinian “Freedom Ride”. 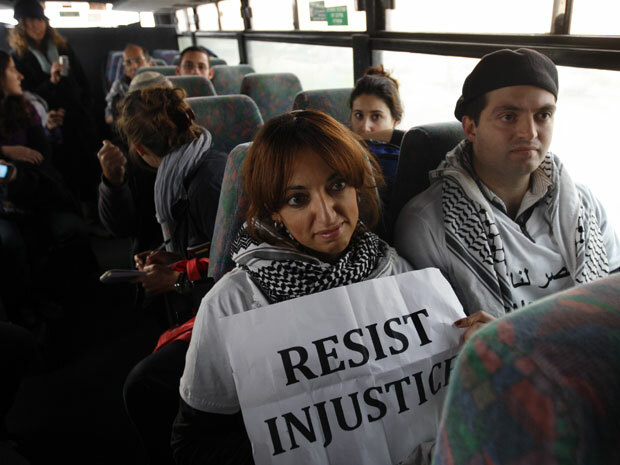 This was the recent attempt by six activists to ride segregated Israeli buses all the way to Jerusalem. Due to the system of Israeli apartheid in effect in the West Bank, they were dragged off the buses by the Israeli occupation forces at a checkpoint. But the appeal to drawing a parallel with the US civil rights struggle of the 1960s seemed to generate a large amount of media coverage (a fact that sent the Zionist fanatics at “Honest Reporting” into a rage, much to my amusement). This key point actually goes to the heart of the current cul-de-sac that the divided Palestinian political leadership finds itself in. Fatah, ruling the West Bank, has put armed resistance aside in favour of fruitless “negotiations” with Israel that have now dragged on intermittently for 20 years. In the Gaza Strip, Hamas too now enforces a ceasefire with Israel – to the point of arresting rival groups of fighters who have challenged Hamas’s interpretation of the ceasefire by launching home-made rockets into Israel. On Thursday, Fatah leader Mahmoud Abbas met Hamas leader Khalid Meshaal in Cairo for talks on a unified leadership of the Palestinian Authority. Meshaal told AFP that Hamas would now start to focus on peaceful popular resistance, while reserving the right to armed resistance. “We believe in armed resistance but popular resistance is a programme which is common to all the factions,” he said. Time will tell whether or not this is as much empty rhetoric as Abbas and unelected Prime Minister Salim Fayyad when they make similar noises about popular resistance. Nevertheless, the fact that Mehshaal even seems to think such statements will increase his popularity is important. It is indicative of a rising tide of popular Palestinian resistance. Aside from the false Fatah-Hamas dichotomy, the wider Palestinian liberation movement is facing existential questions about its nature. While it’s true that, as an anti-colonial struggle, the situation is not the same as the US civil rights struggle, I humbly submit that there is a civil rights aspect to it. Alsaafin notes correctly that “the indigenous population of Palestine is occupied by a colonial settler population”. She says this is a crucial difference – Native American activists might justifiably disagree this factor is so different from the USA. Nevertheless, real structural differences remain, and cannot be brushed aside. Furthermore, Alsaafin’s critique of appeals to the sensibilities of western liberals is an insightful one. Some Palestinians in the first intifada raised the slogan of American revolutionary colonists who split from Britain: “no taxation without representation”. But this appeal was mostly unsuccessful in generating new allies in the US. This is not to argue against Palestinians making grassroots connections in the West (after all, many Palestinians in exile actually live in the West). But it does mean that only hypocrites or racists would insist that the Palestinians rely on begging for outside help to save them. The task for those in the West who would express solidarity with the Palestinian struggle is to follow the Palestinian lead. While it’s true this is made more difficult by a lack of unified leadership, it is no less of an important principle. Furthermore, the lack of a single political leadership actually has an advantage: resistance to political co-optation. The question that Alsaafin raises is both a new and an old one. In his insightful memoir “My Life in the PLO” the late Shafiq al-Hout wrote that the first intifada was the culmination of a long process that had changed the Palestinian national movement “from a national liberation movement to a national independence movement” (p. 234). With the long-dead Oslo process still being periodically disinterred from its ever deeper grave, Palestinians are now more and more questioning the relevance of “national independence” in ever-shrinking parcels of land in the West Bank – to say nothing of the Gaza Strip ghetto. The logic of new trends such as the energetic boycott, divestment and sanctions movement – while being agnostic on the exact contours of a political solution – tilts the balance back towards national liberation once again. The emphasis is on three key principles: the end of occupation, the return of the refugees and full equal rights. Whatever the political solution, and whatever a joint Palestinian programme would look like, these three points are immutable.